Not even early morning showers could deter 100 graduates from The University of Western Australia from celebrating 100 years since the inaugural Convocation of UWA Graduates meeting, on the steps of the very building where the first meeting took place on 4 March 1913. 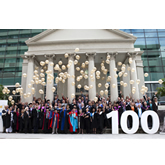 The celebration, a photo shoot and release of 100 balloons on the steps of the façade of St George's Hall at 500 Hay Street in Perth on 4 March 2013, was not only a great event for the 100 UWA graduates who took part - hundreds of passers-by were so fascinated by the spectacle of such a large group of people posing in their academic robes in central Perth, that many of them stopped and took photos. "This very special event was a wonderful tribute to those who established Convocation 100 years ago and allowed us to commemorate that first meeting and acknowledge the role Convocation members have played in the development of UWA into one of the world's great universities," said Dr Fran Pesich, President of the UWA Historical Society, and Convocation Council Member. "And for those who took part - from relatively recent UWA graduates, to some who first graduated more than half a century ago, and even the descendants of inaugural UWA students - it was a great opportunity to catch up with other UWA colleagues, in some cases not seen in many years." One of the very earliest UWA graduates was represented at the event by his great-granddaughter, UWA graduate Barbara Hughes, who carried a framed photo of him. "In 1912, my great-grandfather, James Onward McNamara, had been working as a clerk at the Lands Office in Cathedral Avenue, Perth and just around the corner in Hay Street, the fledgling University of Western Australia was taking applications for its first year of undergraduate courses," said Ms Hughes. Mr McNamara enrolled for a Bachelor of Arts Degree and, in April 1913 at the age of 56, and began attending evening lectures at the new University. He graduated in 1917. "I had only discovered over the UWA centenary celebrations weekend in February that James was an inaugural student and, with my direct connection with one of the very first UWA graduates, I was keen to be part of the Convocation photo shoot," she said. UWA graduate Mary Tannock was also there at the recent celebration and her aunt, May Tannock - later Dame Elizabeth Couchman - was also a 1913 student who graduated in 1916. May Tannock came to Perth in 1913 from Geelong in Victoria to complete a Bachelor of Arts degree at the new free University in WA, studying political science, economics and constitutional law. Dr Pesich thanked all those who took part in the celebration, and all UWA Historical Society and Convocation members who made it all happen. "Thanks to research undertaken by UWA Historical Society's Joan Pope, and hard work by Convocation Councillor and UWA Historical Society member Pauline Tremlett, we were able to appropriately celebrate the centenary of that first meeting back in 1913," said Dr Pesich.